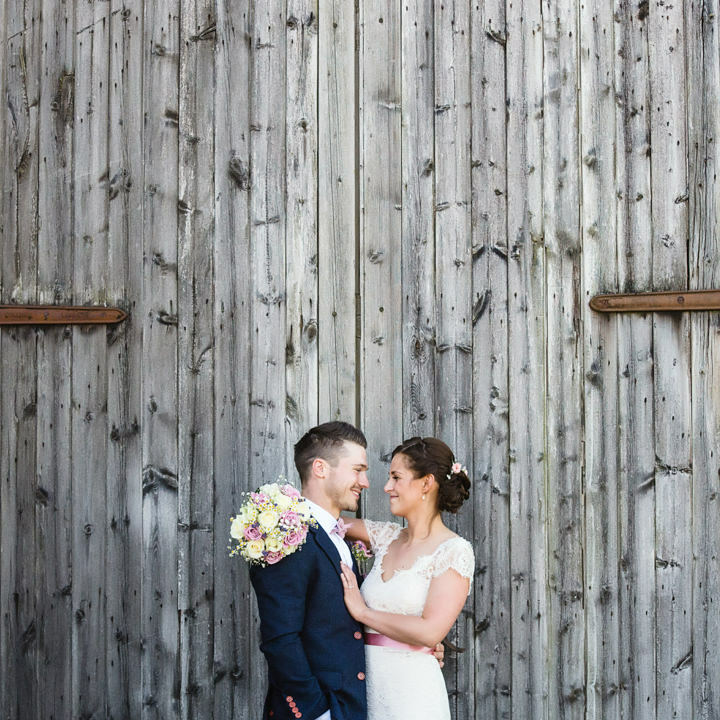 Today we are filling your day with lots of lovely sunshine with this beautiful Hertfordshire Wedding, set in the heart of the countryside. 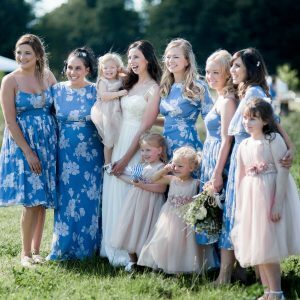 It’s a beautifully laid back day, with lots of pretty pastel, along with an abundance of homemade details, that Emma the bride put together. 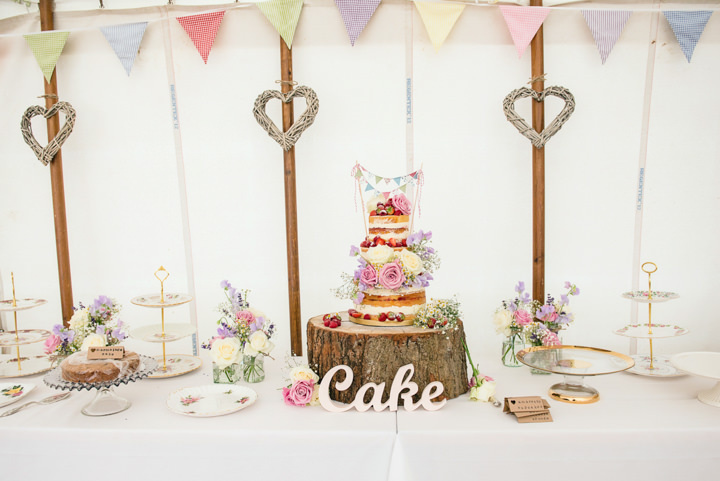 From the stationery to the flowers, the cake table to the bunting, this wedding is jam-packed with homemade touches that I absolutely love. 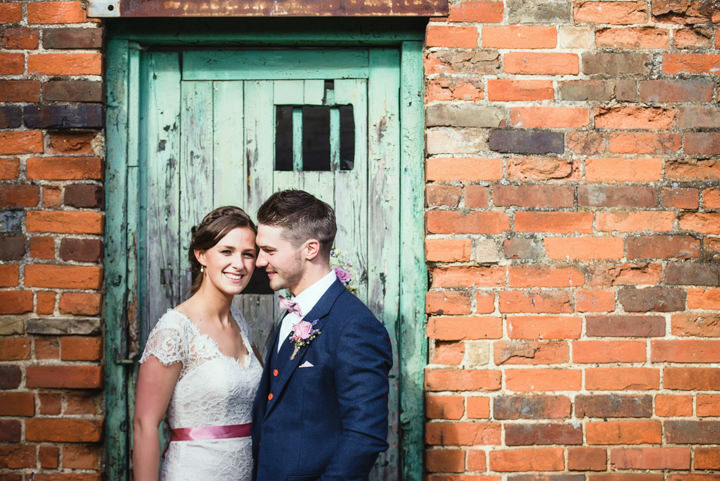 The photography from Sarah Elliot Photography is light, bright and fills the day with so many summer vibes. 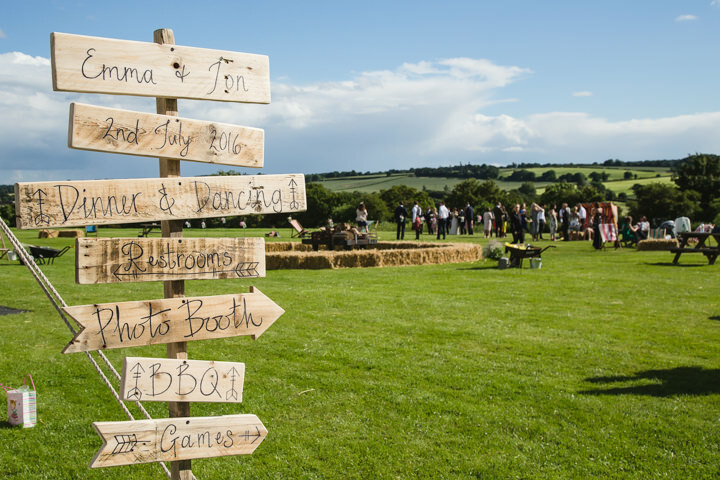 With a BBQ, outdoor games and a fire pit, this wedding is everything that an English country wedding should be. Enjoy! 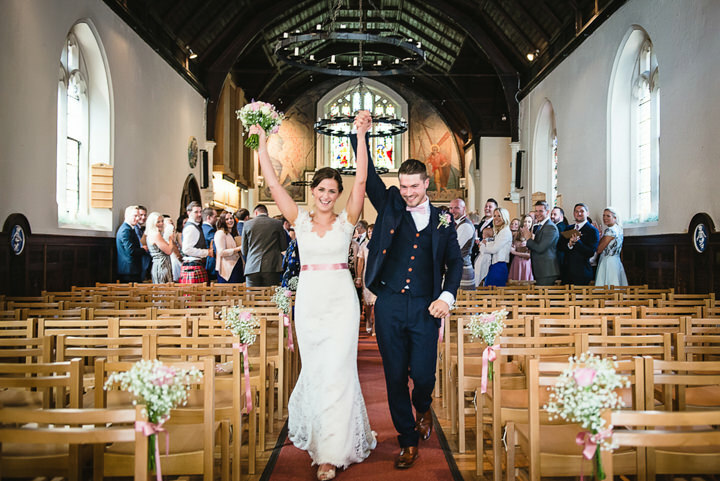 Emma and Jonathan were married on the 2nd July 2016 at St Georges Chapel in Harpenden followed by a marquee at Almshoebury Farm in St Ippolyts in Hertfordshire. 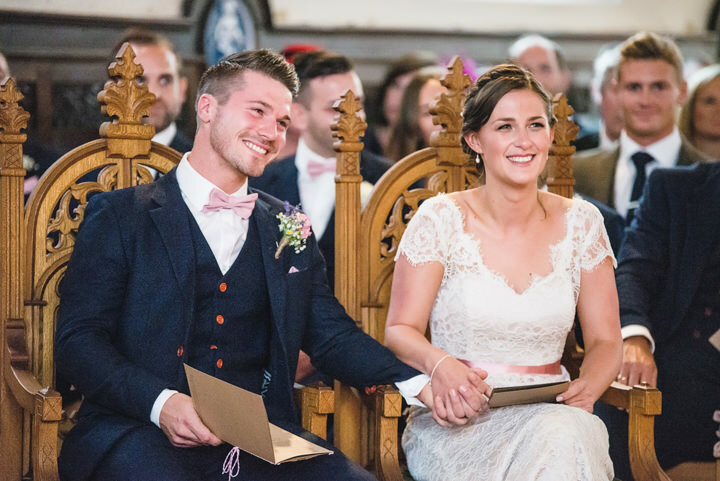 ‘Jon had always wanted to get married in the Chapel at his old school even before we got engaged so it was top of our list of ceremony locations as it meant so much to him. He attended the secondary school and sixth form at St Georges, his dad has been a teacher at the school for over 30 years and his family also lived in the boarding house for a number of years too as his dad was the board master. 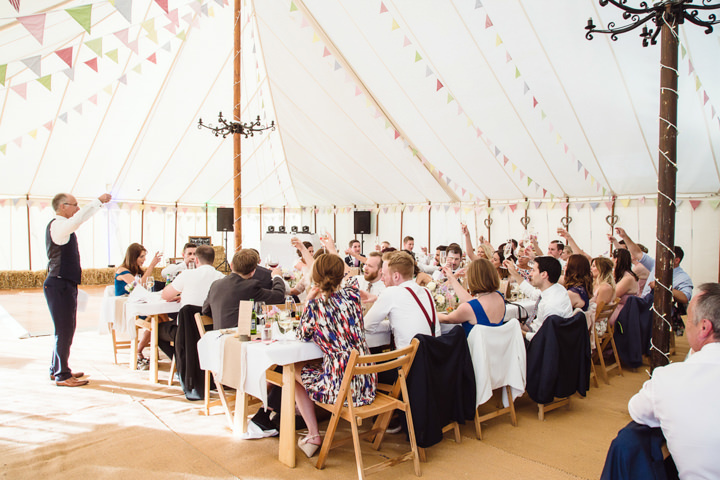 We knew we wanted a laid back marquee wedding with games and other personal touches so we needed a venue that would allow us the blank canvas to bring our wedding to life. 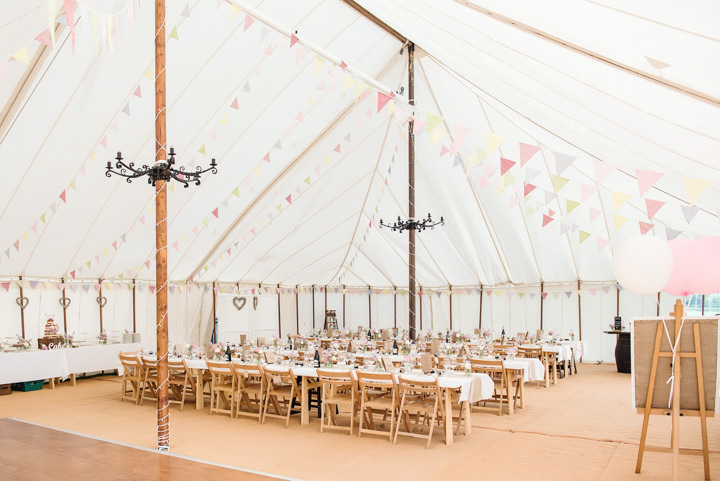 When we visited Almoshoebury Farm and saw the huge space available to us, it was exactly what we wanted and didn’t hesitate to book. 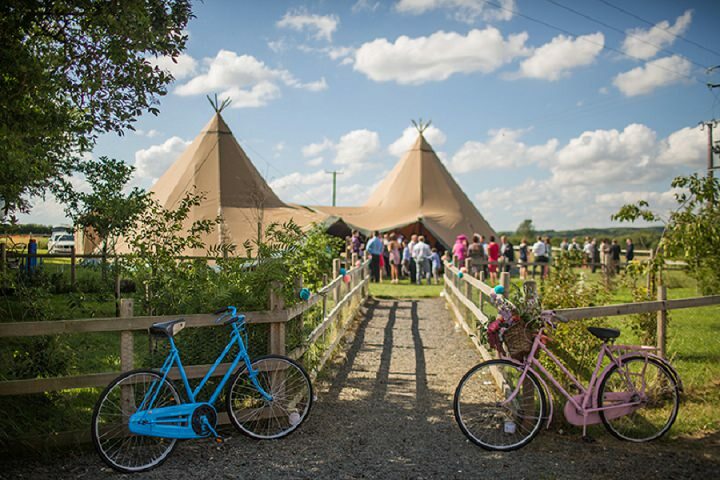 We had 90 guests in the day and an extra 50 in the evening. 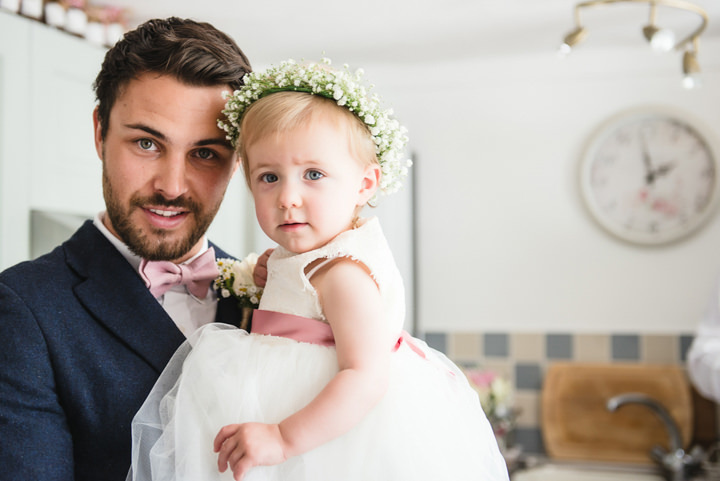 It took us 21 months from when we got engaged to the wedding day but we did take our time with the plans and preparations and we had a baby in that time too. When we got married we had been together just over 6 years. We met at one of my friends birthdays. Jon had booked a surprise trip to Rome for my birthday, he knew I had always wanted to go there. We had a wonderful trip sightseeing and relaxing in little cafes, eating pizza and gelato! On our second to last day he suggested we had a picnic in a lovely quiet old park just outside the centre of the city. 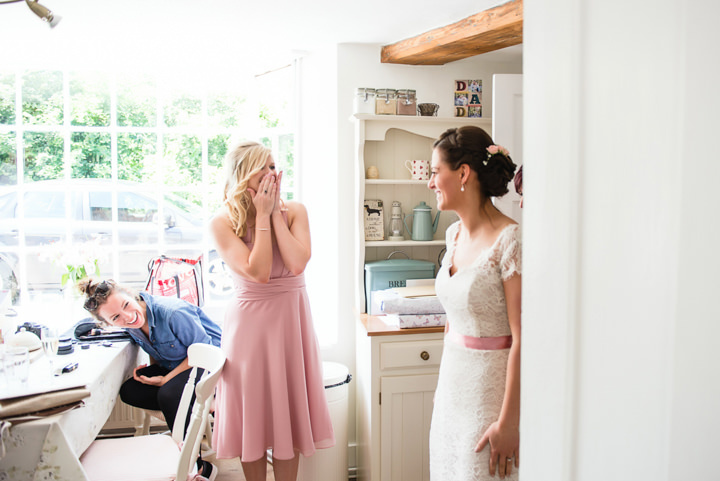 Unfortunately for Jon it didn’t quite go to plan as I fell asleep on the picnic blanket after eating which was when he had planned to propose…. I think it threw him off so when I woke from my snooze he suggested a walk to a little boating lake in the park. We had a wander through the park and after going out on one of the little rowing boats on the lake he then asked if we could get the picnic blanket out and sit down again. He produced a book from his bag which he had managed to keep hidden which told a little story of our life so far with lots of lovely pictures, at the end of the book he got the ring out of his bag and asked me to marry him! I still don’t think he has forgiven me for falling asleep at his big moment which he had carefully planned out in the weeks leading up to the trip. 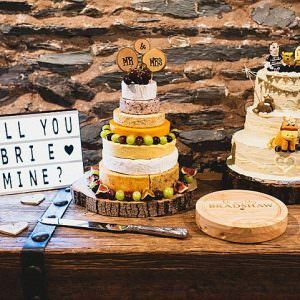 We planned as best we could using a spreadsheet that my friend had sent on after her wedding. 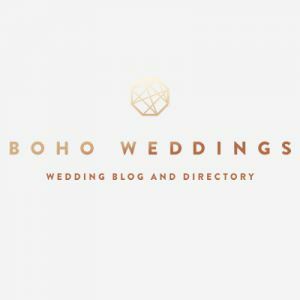 We listed out all the main items required for the wedding and with some research put an estimate for each item on the budget sheet and adjusted it according to our priorities. 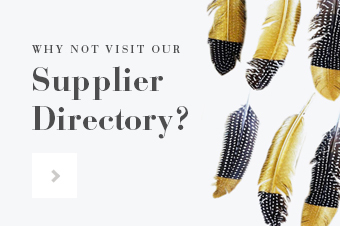 We made some items a higher priority and others we removed budget from and decided to keep them as low cost as possible. 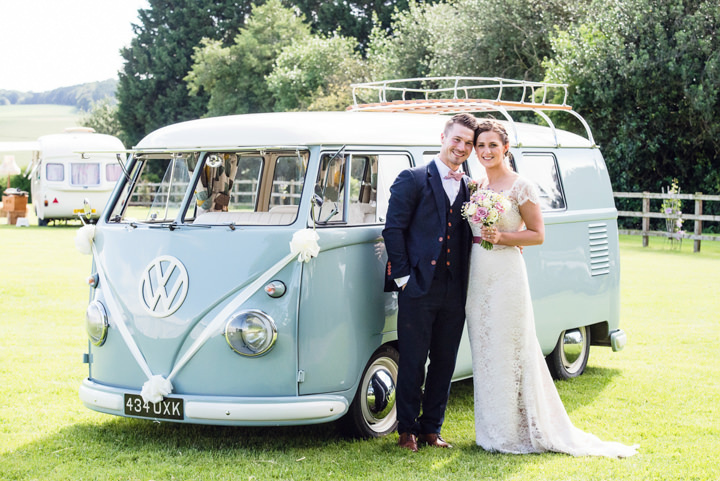 We both knew we always wanted to have a VW camper van as our wedding car, so it was always going to be something that we splurged on. 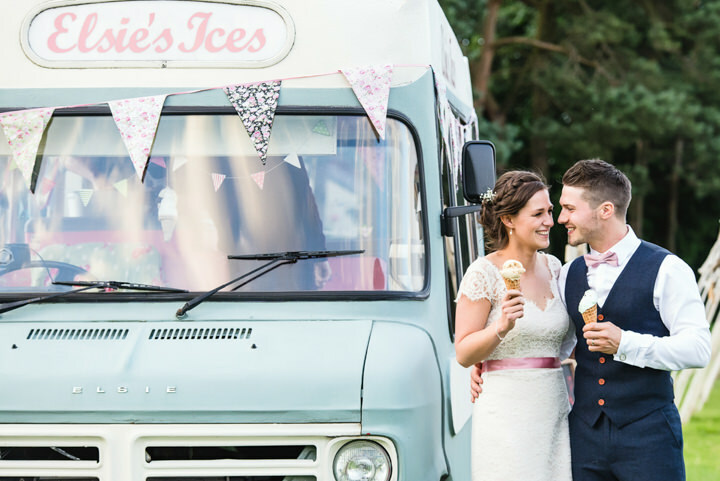 We both LOVE our ice cream too so that was something I wanted to incorporate into our wedding and we splurged on a beautiful old vintage ice cream to serve handmade gelato like we had eaten in Rome. 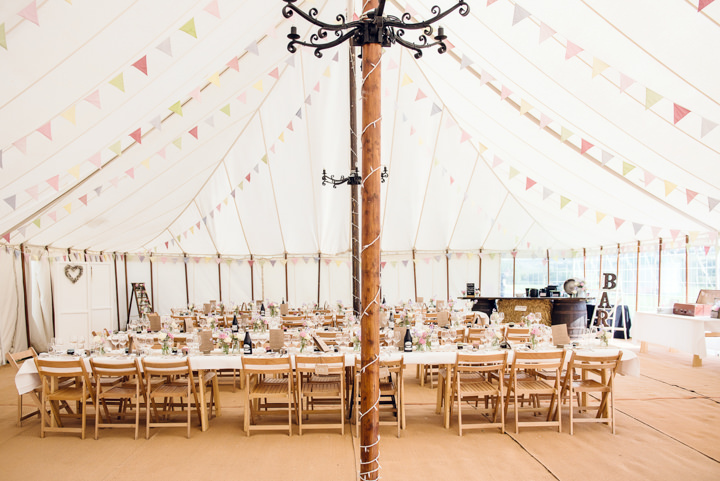 We saved money by making all of the wedding stationary and favours ourselves and decorating the marquee and field with handmade decorations and flowers which we did ourselves. 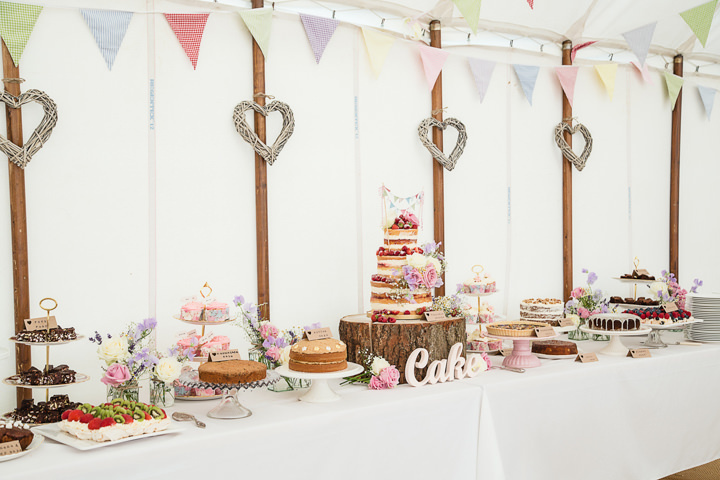 We also saved money by having a BBQ for the main meal and asking our wonderful friends and family to makes cakes for a dessert table. We spent ages looking at different photographers online this was the one thing we had been putting off as Jon hates having his picture taken and was really worried about having posed pictures taken. I looked at lots of photographers online and emailed a few. 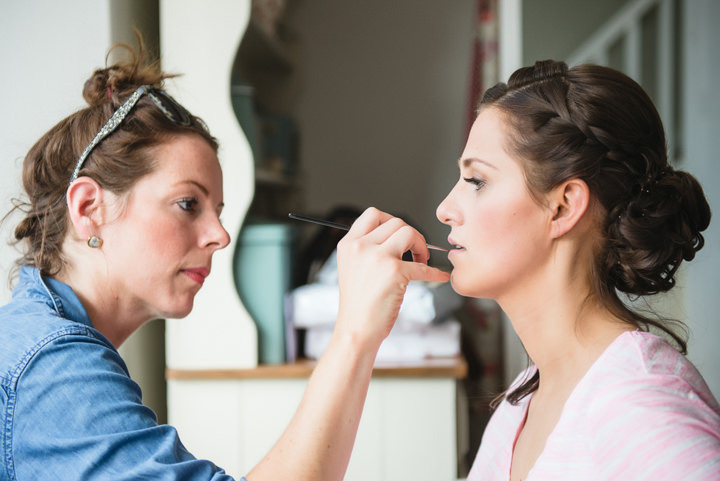 Sarah was the first photographer that we met and I cancelled all the others I had planned to meet after her as we just knew straight away she was what we were looking for! Her pictures were beautiful and so light and colourful and natural. 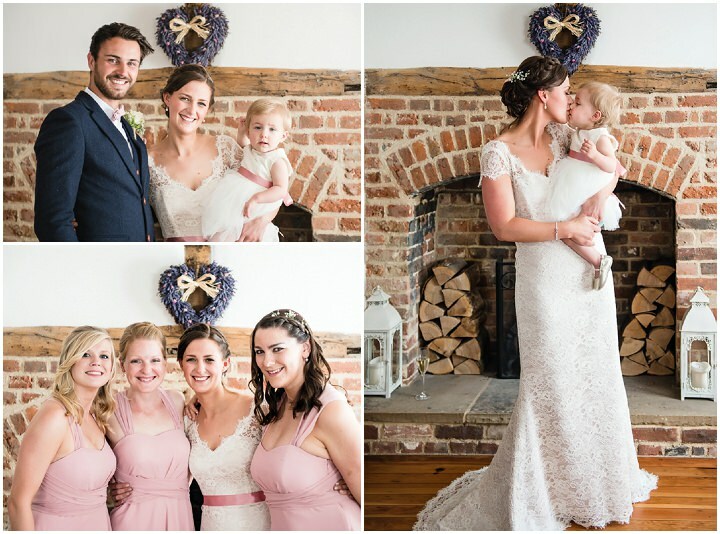 We met for a coffee with our little girl and we chatted for ages and she was so good at engaging with Isabelle and we all felt relaxed so we knew we had found the right photographer for us. Sarah took some pictures for us before the wedding when Isabelle turned one, we had a little cake smash session and a family shoot in a lovely sunny bluebell wood. 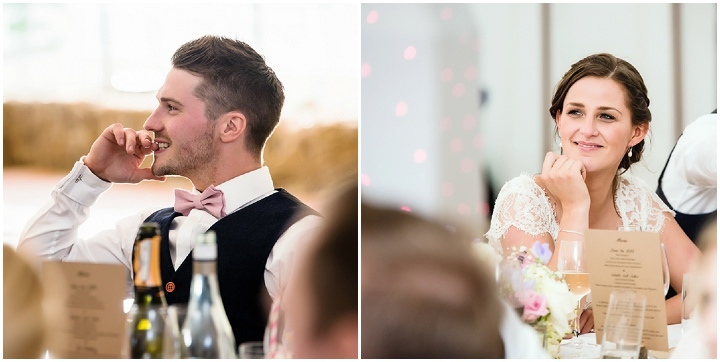 I knew as soon as those pictures came back we had found ourselves the best photographer we could have hoped for! 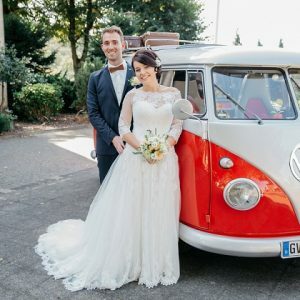 I really struggled with my wedding dress, I went to lots of shops and I just could not find the kind of dress I had in mind and that I had been pinning on Pinterest since we got engaged. 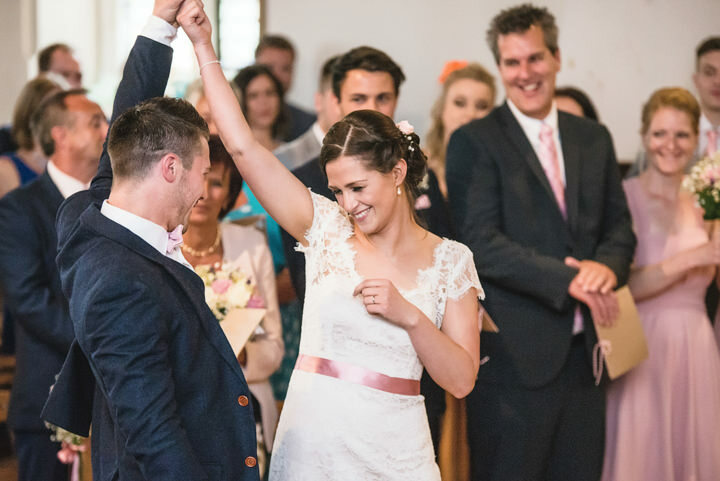 Caroline had made Jon’s sisters beautiful wedding dress a few years before and by chance we ended up in the same antenatal classes. 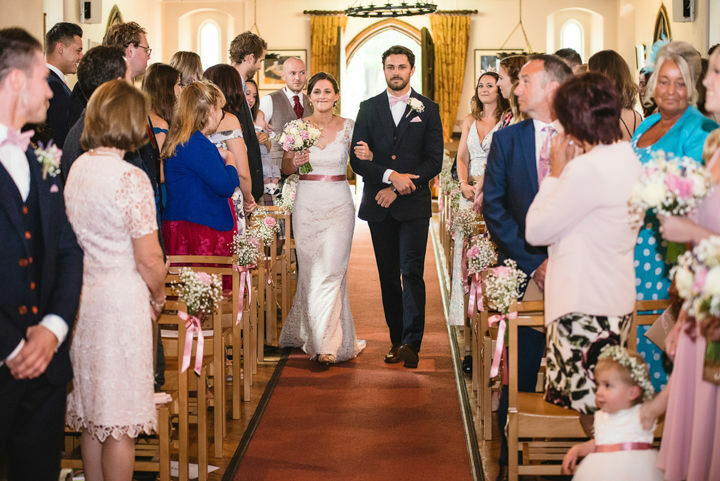 I went to her shop when I was struggling to find what I wanted and she completely put my mind at ease, assuring me she could make me exactly what I wanted and I could pick the lace and colour fabrics I wanted to make it perfect and even better she worked to my budget! After chatting and showing her some pictures she went away and drew exactly the dress I wanted, incorporating different elements of dresses I had seen pictures of into one perfect dress. 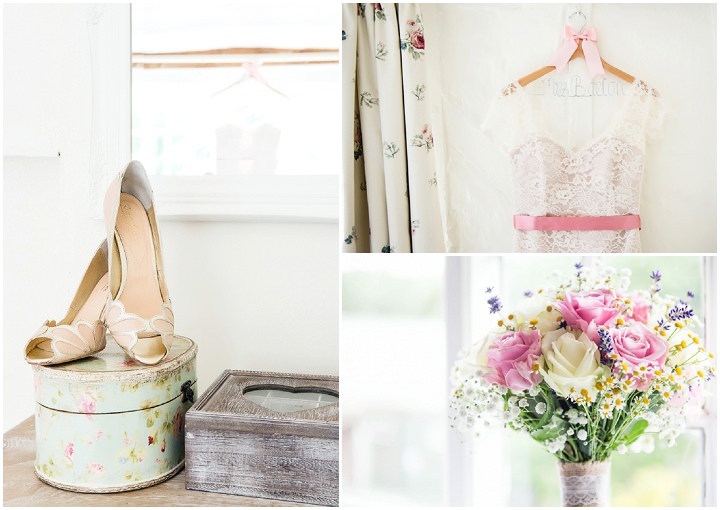 I chose my shoes from Rachel Simpson as I had always loved their bridal shoes, they were expensive but when I saved money having my wedding dress made I knew I was going to splurge on a pair of their gorgeous shoes. 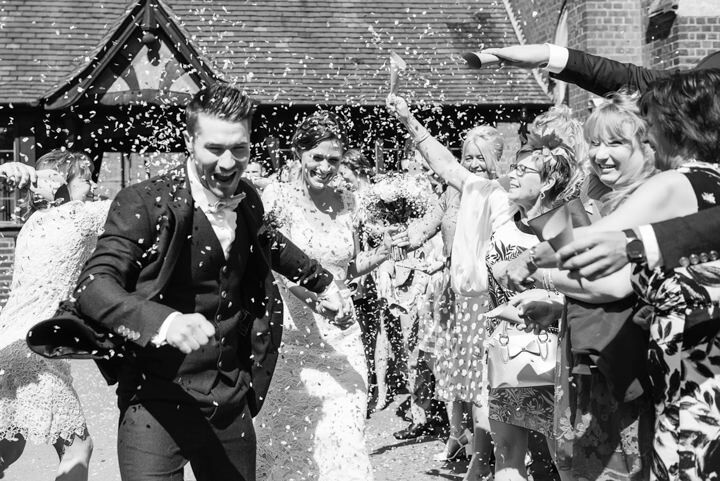 Jon had always wanted to wear a tweed suit and waist coat for the wedding so we knew what we were looking for but hadn’t banked on how expensive it was going to be. 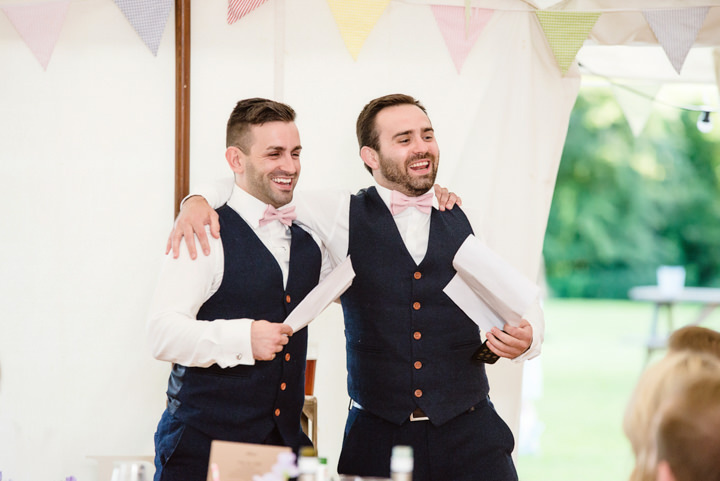 Especially with two best men, four ushers, his dad and my brother to dress as well! We ended up deciding to hire the suits as buying would cost too much. Jon travelled to Southampton with his dad to try on the suits in Victor Valentine and they were perfect. 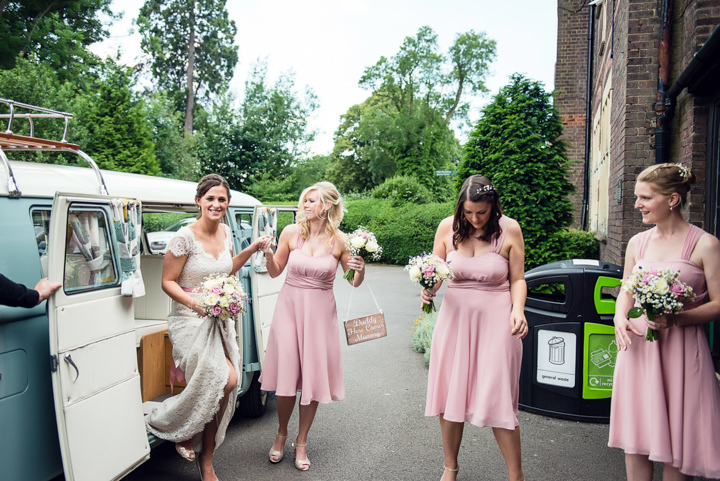 My bridesmaids wore a blush pink dress that we bought from Monsoon to match the colours of the wedding flowers with gold sandals. 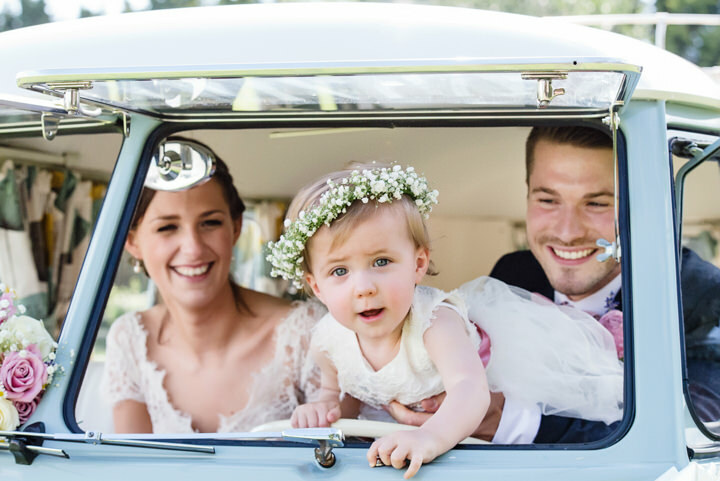 While making my wedding dress, Caroline said she would love to make my little girl a dress using the same lace I had picked for mine. 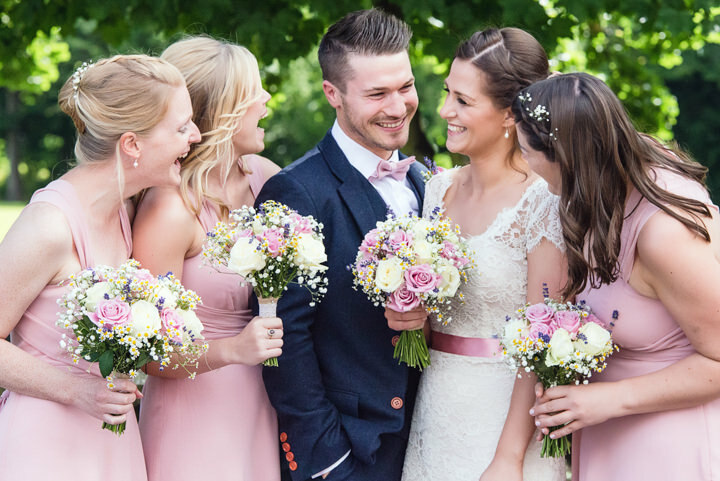 We did all of the flowers ourselves, I wanted to keep them summery and simple and chose colours that would go with the blush pink theme of the day. We have a little florist in the village and they agreed to buy all of the flowers for the wedding when they went to the flower market in London on the Thursday before our wedding. 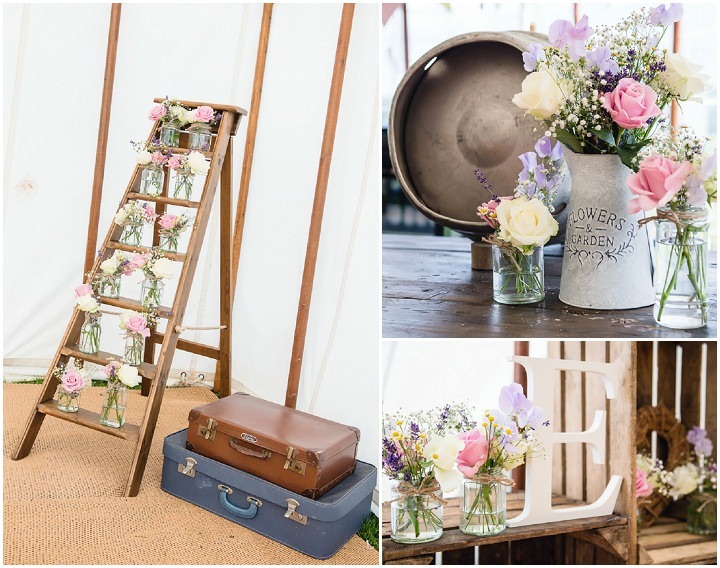 I chose a mix of pinks, whites and purples and I love all the simple English country garden type flowers. 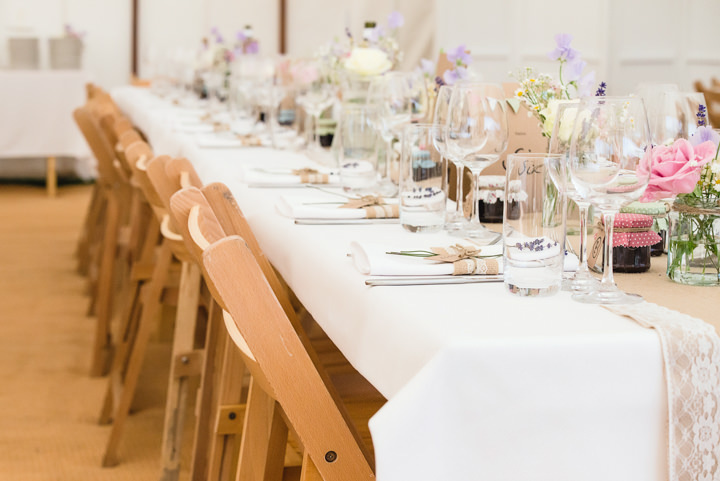 Luckily we had lots of help from my bridesmaids and family as I think I collected around 120 jam jars and other jugs and buckets to fills with flowers to decorate the tables and outside the marquee. 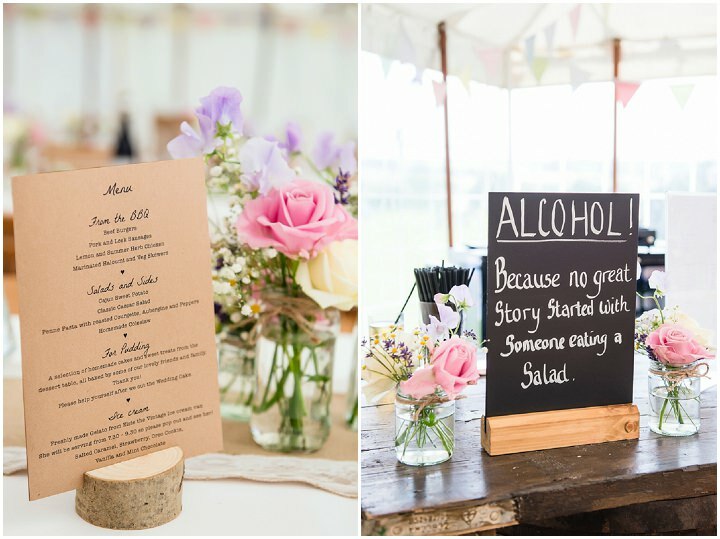 We wanted a laid back country summer wedding so we tried to keep it simple. 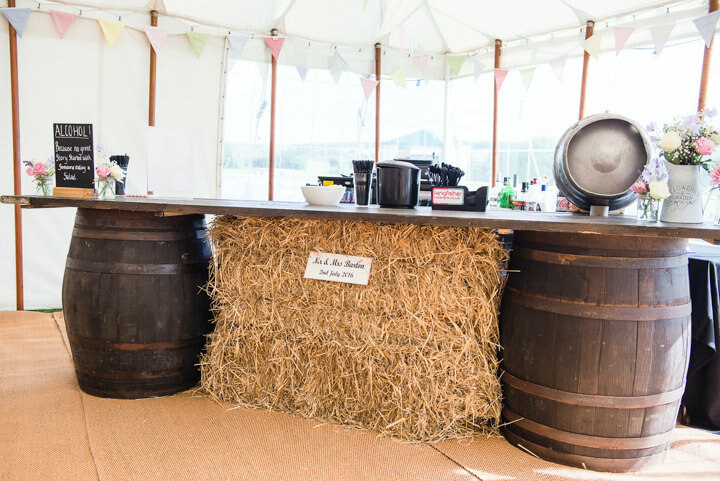 We had lots of bunting to hang in the marquee and outside, we used hay bales and deck chairs for seats inside and outside. 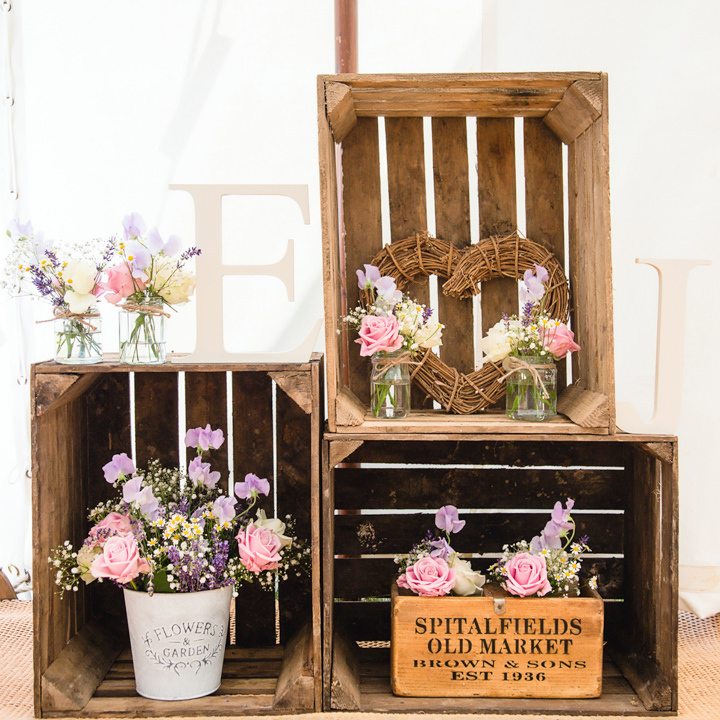 We decorated with wooden crates, flowers, fairy lights and tea lights in hanging jars and made wooden signs to put up around the field. 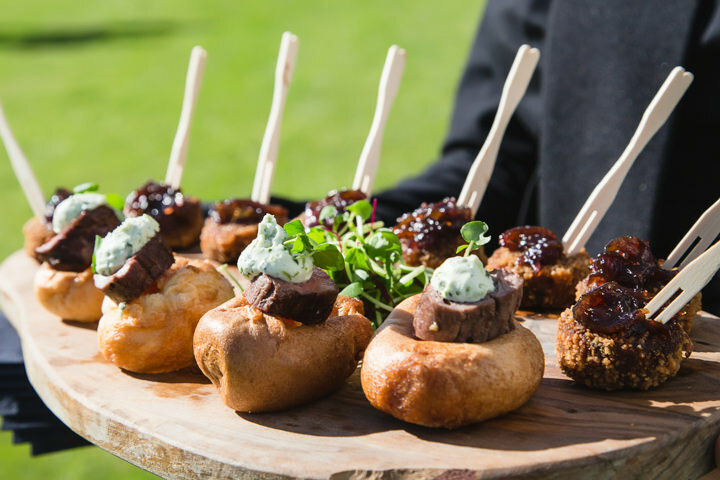 We really wanted a relaxed and casual meal to fit with the theme of the day so we decided to have a big BBQ! It went down fantastically and the weather held out so we were really pleased. 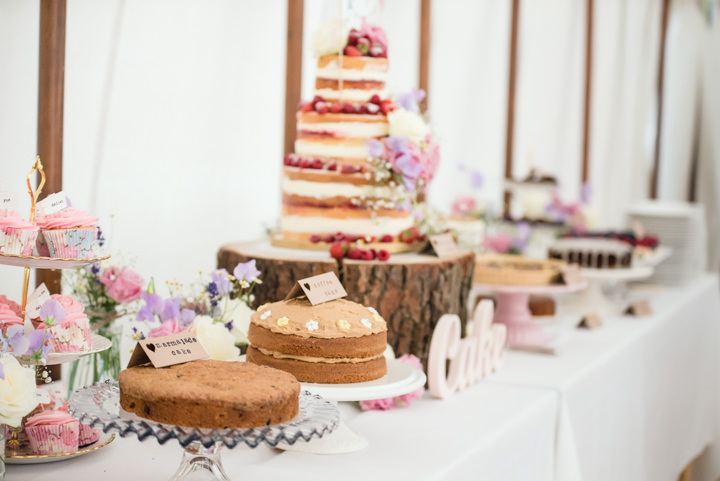 We had a huge dessert table for pudding, all our wonderful friends and family helped make delicious cakes which we displayed on a table in the marquee. 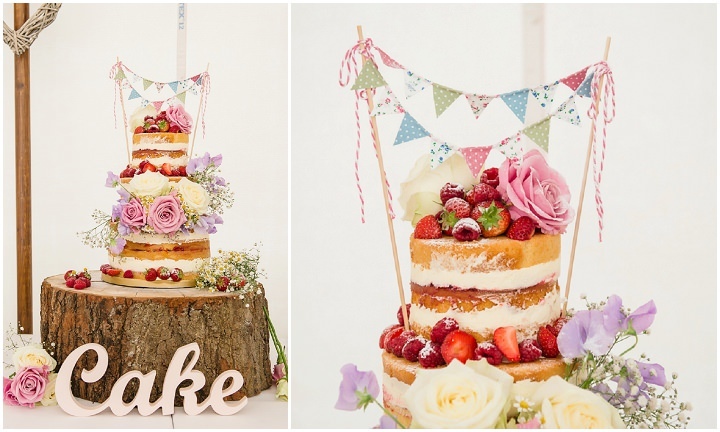 We had a big naked Victoria sponge cake decorated with some of our flowers as our main wedding cake and after we cut that people could go up and help themselves to cake whenever they wanted during the evening. 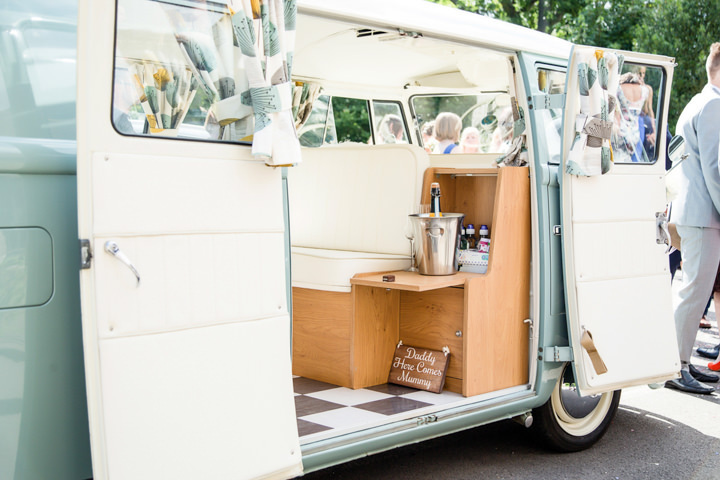 We also had a fantastic vintage ice cream van that served the best gelato to all the guests after dinner too, it was delicious! 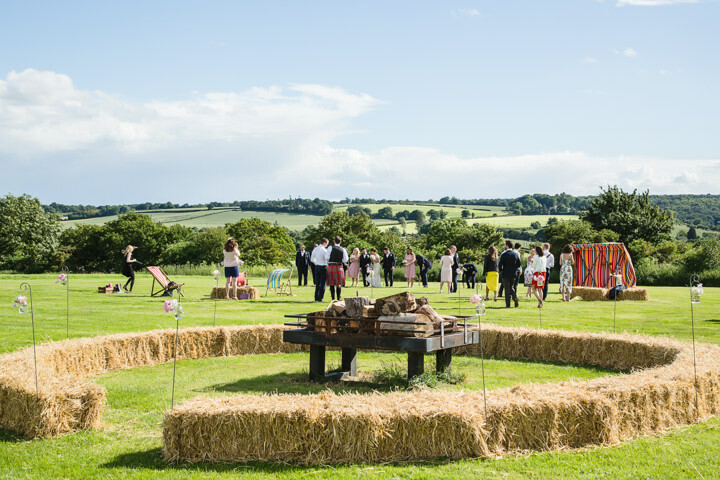 We decided on a hog roast to feed the evening guests and any of the day guests that were still hungry! It disappeared in record time, neither Jon or I managed to get any but I hear it was delicious! 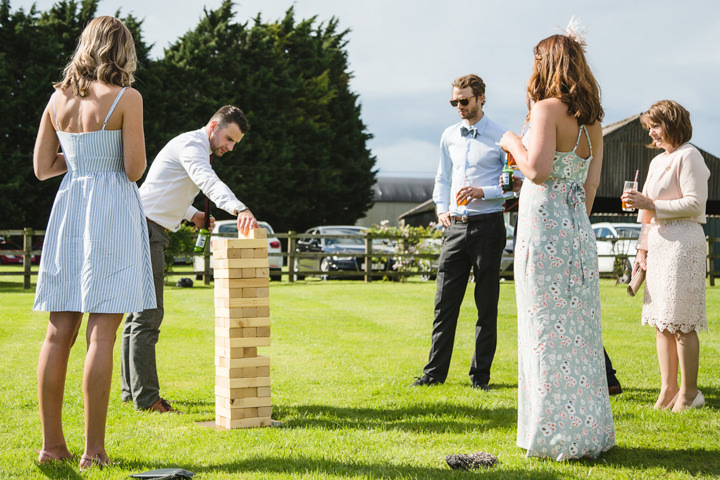 We picked lots of English summer fete games to have outside for the guests to play with during the reception drinks and then after dinner with evening guests. 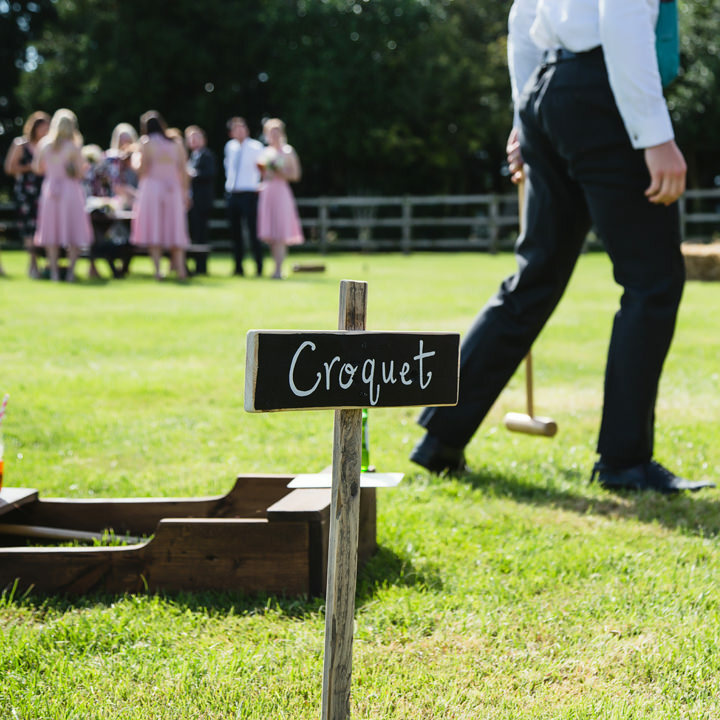 We hired a coconut shy, croquet, giant jenga, skittles and ring toss from a lovely local company who delivered for us the day before the wedding. 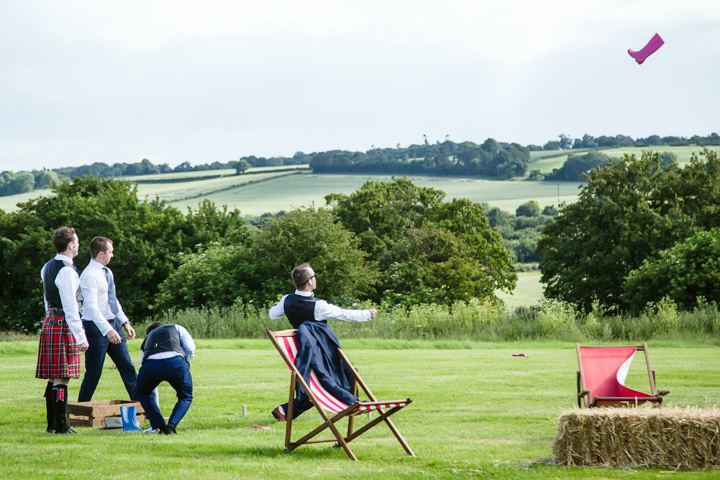 I also collected old wellies for some games of welly wanging which the guests loved and I bought some space hoppers for people to have races on. 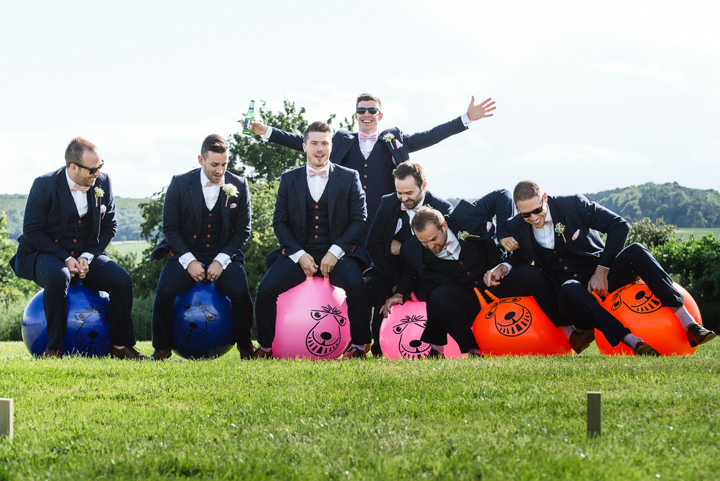 One of my favourite pictures is of Jon and the groomsmen on the hoppers! 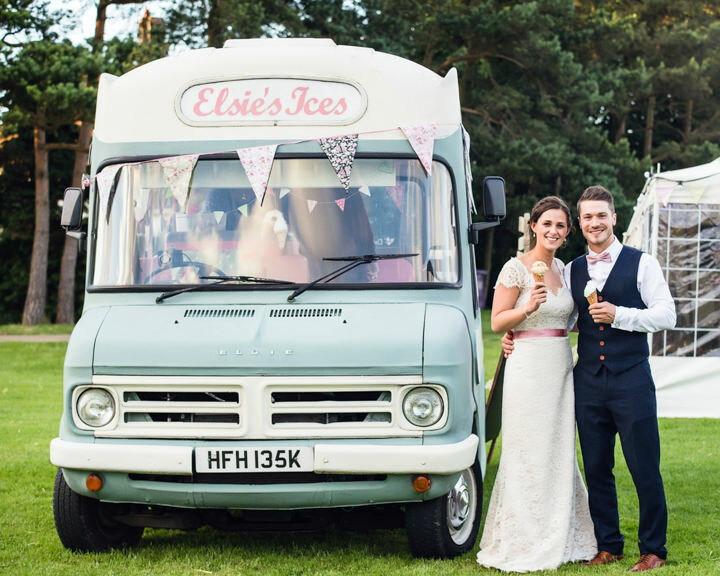 We found an amazing vintage caravan photobooth which was set up outside with all the games for everyone to use in the evening and of course we had the icecream van too. 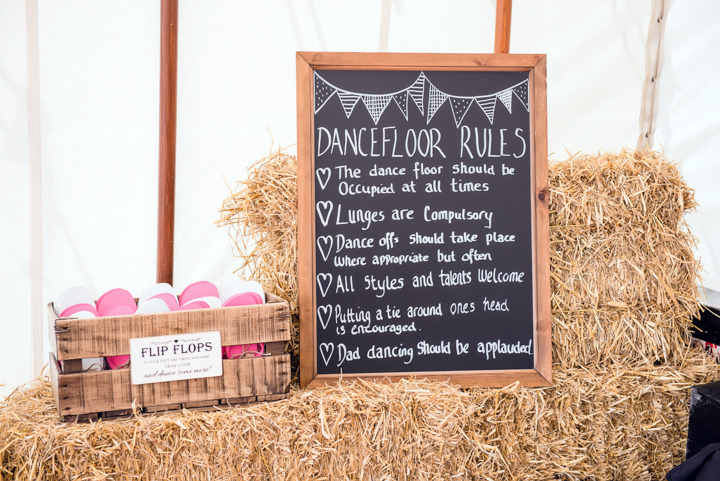 We had a DJ inside the marquee after dinner and we asked our guests to pick songs to add to our music request list when they RSVP’d to our invitation as we wanted to make sure there was something for everyone and they all got up for a dance. 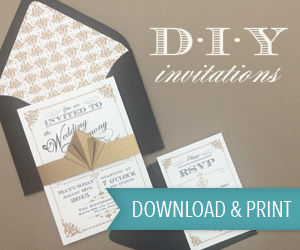 I handmade all of the stationary for the wedding, including invitations, order of service, menus, table plan and numbers. I bought brown kraft card and designed all of the templates to have printed on the card and I made hundreds of mini bunting flags and put them onto strings of pink and white twine and stuck them on all the stationary. I think I made over a thousand mini bunting triangles in the months leading up to the wedding it was much harder than I thought when I started out. 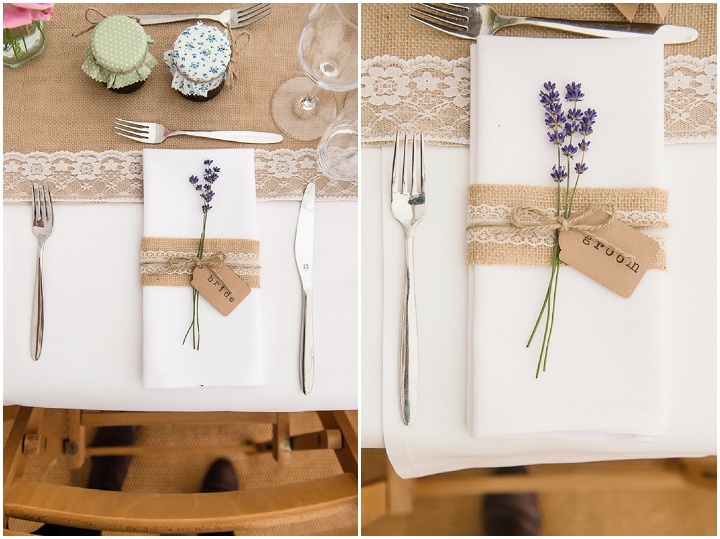 I hand stamped all of our guests names onto krafts tags for the table settings and tied them round the napkins with some string and hessian and lace with some lavender. 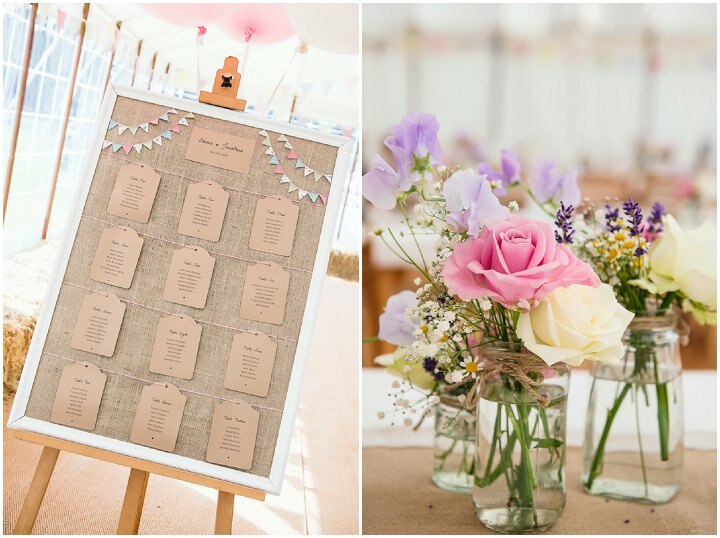 I bought our gorgeous confetti from Shropshire petals and I made 90 confetti cones for them from brown kraft paper with our names and wedding date printed in the corner. 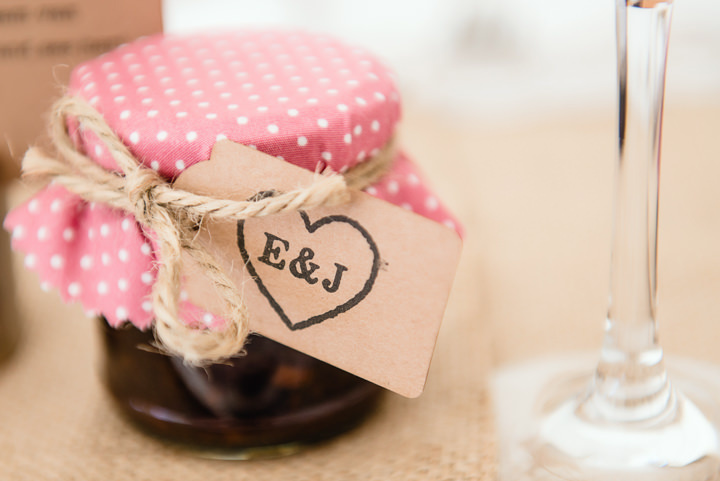 We also made mini jars of chutney for our wedding favours and I covered the lids with the same fabric as the bunting so the colours all matched the other stationary items on the tables. 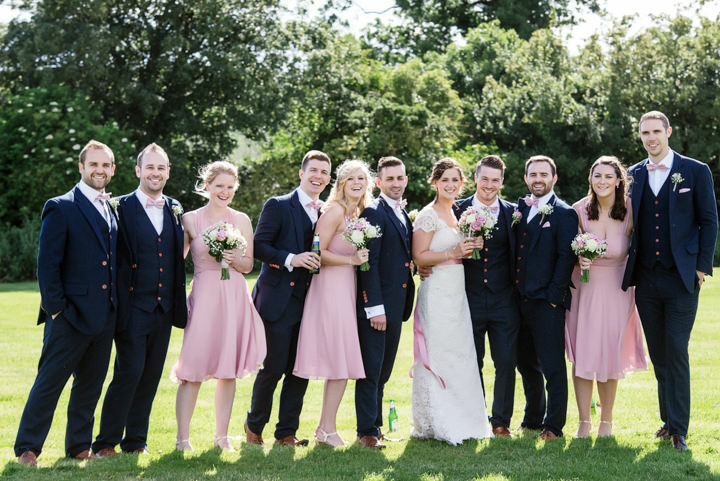 A friend of ours and her sister also made all nine of the groomsmen their bow ties and pocket squares in the exact fabric and colour we wanted, they looked great with the navy tweed suits! 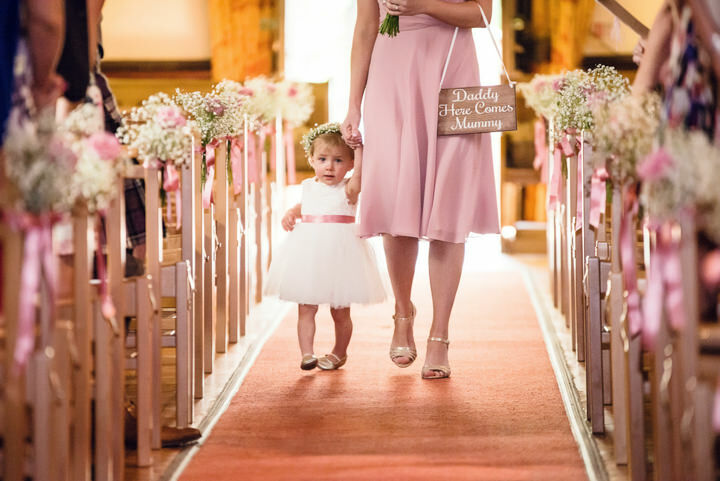 Our little girl toddling up the aisle in front of me as she had just recently learnt to walk was perfect and she looked adorable in her little dress and flower crown. 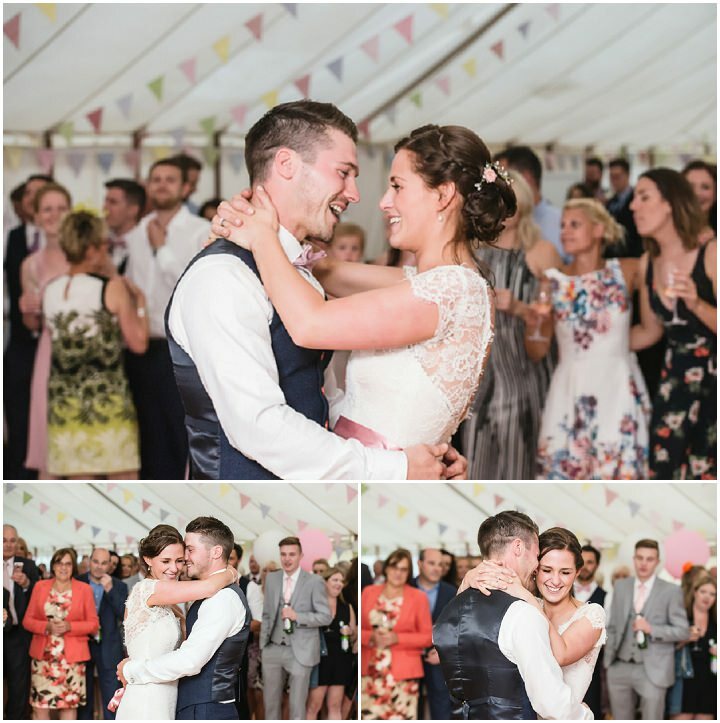 It’s hard to pick just one special moment it was all perfect! The sun came out and shined on us after raining all of June and causing a great deal off worry with the outside games and BBQ we had planned. But someone was looking out for us and the weather was fantastic! Having all of our friends and family together for one big celebration was even more amazing than we could have imagined.